Nikola Tesla died alone. At the age of 86, he died without children; he died without a wife; he died without anyone by his side. After devoting the entirety of his existence to the single-minded purpose of furthering the field of science, one of the most brilliant minds in human history died in a hotel room, his body found two days later by a maid. Impoverished and in debt, Tesla spent his final days living off warm milk and Nabisco crackers. While his genius was recognized during his lifetime, following his death, his name fell into obscurity. He was exploited by those who coveted his ingenuity, his greatest ideas never came to fruition due to human greed and ignorance, and for decades, others received credit for inventions that he pioneered. Of course, no human invented electricity, but the man who has historically been lauded for leading humanity into the electric age is Thomas Edison. In fact, Edison's direct current (DC) electric power distribution system is not what's powering your home right now, but rather the much cheaper, more efficient, and more effective alternating current (AC) system - developed by Tesla. The late 1880s saw the "War of the Currents," in which the two companies that owned these patented technologies squared off: the Edison Company vs. Westinghouse Electric, which had acquired Tesla's AC patents. Edison's DC system was the standard used in the US, and he saw AC as a threat to his monopoly. Rather than learn to work with a clearly superior technology, Edison began a smear campaign to discourage the use of AC. To prove how "dangerous" AC power was, Edison had animals - including cats and dogs - publicly electrocuted with AC power. In fact, Edison secretly paid for the invention of the electric chair. During the chair's first execution of a condemned prisoner, the technicians failed to use enough power to kill the man on the first go. According to an onsite reporter, this torture was "an awful spectacle, far worse than hanging." Prior to this, Tesla actually worked for Edison, for a time. 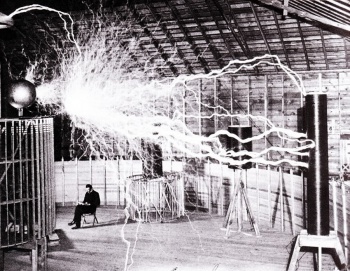 After a few months with his company, Tesla told Edison that he could redesign his inefficient DC motors and generators. Edison promised Tesla $50,000 - well over $1 million by today's standards - if he could do it. Tesla did it, and when he asked about payment, Edison stiffed the immigrant, saying, "Tesla, you don't understand our American humor." Funny guy.